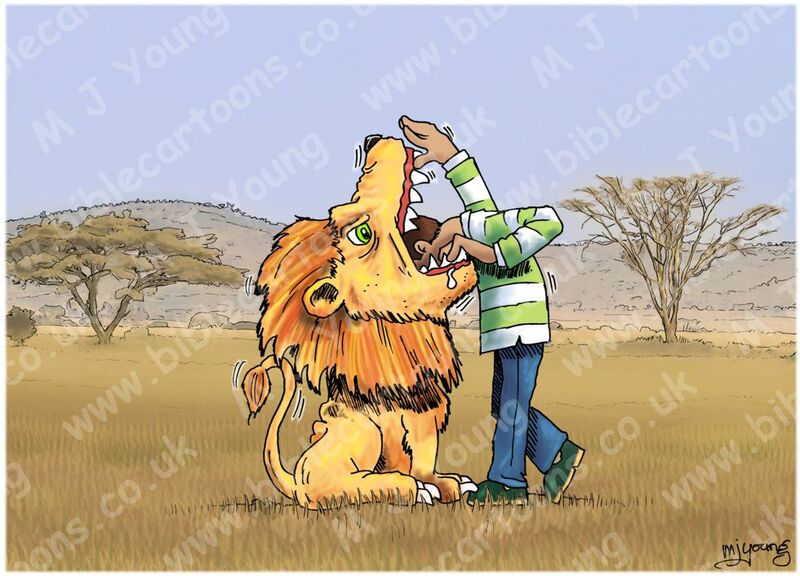 Bible Cartoons: Man with head in lion! Man with head in lion! I’ve just completed another Meta4 picture – this one is based on a mug design I drew for a friend. You can see the scene under “Meta4s” on the menubar. The picture is inspired by the Joshua 1:7 quote “Be strong and very courageous”. For this version of the picture (in Meta4s) I have added an African scene in the background. I found a suitable photo on the internet, then modified it, altered colours & tones, & added the black outlines around the hills, trees, bushes, etc. I have also faded it, so that it doesn’t take the viewers attention away from the man & lion in the foreground.